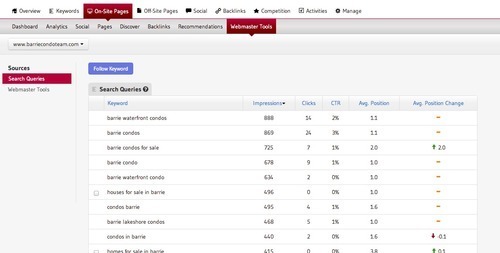 gShift’s Google Webmaster Tools integration offers agencies the ability to supplement keyword research data, gain insight into any web site errors such as 404 pages or crawl issues, and keyword phase search impression, average rank and click through data. Once you authorize access to your client’s webmaster data, gShift will begin to pull data on a daily basis. In order to gain access to impression, average rank and click through data, you must follow an advanced set-up plan. You an either add a gShift email address (recommended) as a user of that webmaster account or you will need to provide gShift support with your agency email address that has access to all of your clients webmaster accounts. We are following Google’s authorization instructions which typically follow the same security as how we authorize your clients Google Analytics. However, this part of GWT has legacy authorization that we need to follow to access this data. Average Rank does not take into effect any web presence pages (YouTube Videos, Blog Posts, Press Releases, Social Media sites and/or other urls). All of your keywords will not be listed. Click through data will not correlate with your Google Analytics Organic Traffic. Why is it important for me to integrate Google Webmaster Tools with gShift? By connecting Google Webmaster Tools with gShift, you can view your site’s internal and external anchor text, keyword research, error messages and Not Provided insight. How do I connect Google Webmaster Tools to gShift? Within your presence, go to “Manage” and click on your website’s hyperlink underneath the site’s thumbnail to access the details. Once you have clicked on the link, scroll down to the “Google Webmaster” section. Make sure you are logged in with the correct account, then click on “Authorize”. You will see a new message appear to contact Support to access Search Queries. If you would like to see this data, please file a ticket in gShift or email support@gshiftlabs.com. How long will it take for the Google Webmaster Tools information to display? Once you have connected your WMT account, you will see your data within 48 hours. How often do you get the data from WMT? The data is collected daily. How long is the past data accessible in gShift? You will have the information available to you for the full duration of your subscription. We can provide you with the last 30 days of data.